The Southwest Script or Southwestern Script, also known as Tartessian or South Lusitanian, is a Paleohispanic script used to write an unknown language usually identified as Tartessian. Southwest inscriptions have been found mainly in the southwestern quadrant of the Iberian Peninsula, mostly in the south of Portugal (Algarve and southern Alentejo), but also in Spain (in southern Extremadura and western Andalucia). The name of this script is very controversial. The more neutral name is southwestern, because it refers only to the geographical location where the inscriptions had been found, but it needs some additional precision in a general context. Some researchers name this script Tartessian considering it the script of Tartessos. Others prefer to name this script as South Lusitanian, because almost all the southwestern inscriptions have been found in the south of Portugal (an area included in the Roman province of Lusitania), where the Greek and Roman sources locate the Pre-Roman Conii or Cynetes people, rather than in the zone generally considered Tartessian (between Huelva and the Guadalquivir valley). But on the other hand, the name South Lusitanian is inconvenient, as it may wrongly suggest a relation with the Lusitanian language. Other name proposals include Bastulo-Turdetanian and escrita cónia. The southwestern script is very similar to the southeastern Iberian script, both considering the shape of the signs and their value. The main difference is that southeastern Iberian script doesn’t show the vocalic redundancy of the syllabic signs. This characteristic was discovered by Ulrich Schmoll and allows the classification of a great part of the southwestern signs into vowels, consonants and syllabic signs. 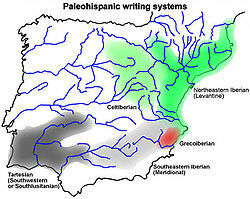 Unlike the northeastern Iberian script the decipherment of the southeastern Iberian script and the southwestern script is not yet closed, because there is still a significant group of signs for which there is no consensus value. A total of 75 southwest script steles are known. Of these, 16 can be seen in the Southwest Script Museum (Museu da Escrita do Sudoeste, in Portuguese), in Almodôvar (Portugal), where a stele with a total of 86 characters (the longest inscription found so far) discovered in 2008 is also on display. ^ Dias, Carlos (2008), "Descoberta perto de Almodôvar a mais extensa inscrição em escrita do sudoeste", in Público, Ano XIX, n.º 6742 - 15/09/2008, p.18. ^ "Experts trying to decipher ancient language". Retrieved 14 August 2016. ^ "Experts aim to decipher ancient script 2,500-year-old writing found on stone tablets in Portugal". Retrieved 14 August 2016. Correia, Virgílio-Hipólito (1996): «A escrita pré-romana do Sudoeste peninsular», De Ulisses a Viriato: o primeiro milenio a.c., pp. 88–94. Ferrer i Jané, Joan (2016): «Una aproximació quantitativa a l’anàlisi de l’escriptura del sud-oest», Palaeohispanica 16, pp. 39-79. Rodríguez Ramos, Jesús (2000): «La lectura de las inscripciones sudlusitano-tartesias»[permanent dead link], Faventia 22/1, pp. 21–48. This page was last edited on 2 March 2019, at 14:33 (UTC).